Knoxville, a city of 183,000, combines high technology with southern hospitality. Just a short drive from the Great Smoky Mountains and from TVA’s Great Lakes of the South, Knoxville has a tremendous variety of recreational activities. The city’s strong economy supports a mix of manufacturing and service industries. Many educational opportunities are found here with the University of Tennessee, numerous junior colleges, and an excellent public school system. A career in law enforcement can provide a challenging and rewarding way to serve the Knoxville community. Our officers must meet the highest standards and show service excellence while serving the community. If you feel that you possess the qualities and desire to excel as a law enforcement officer, a career with the Knoxville Police Department may be right for you. 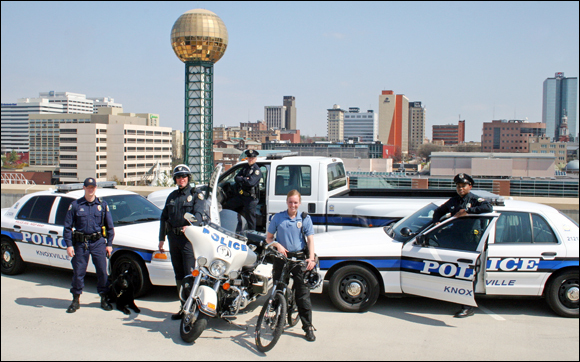 The Knoxville Police Department is an internationally accredited police department, which currently employs approximately 400 sworn and 120 civilian personnel.